Wood grain fitted table cover makes an ordinary table look like hardwood! Elasticized wood-style “grain” vinyl wipes clean. Soft backing of fitted table cover protects. Imported. Small round fitted vinyl table cover fits tables up to 44" diameter. Large round fits tables up to 56" diameter. 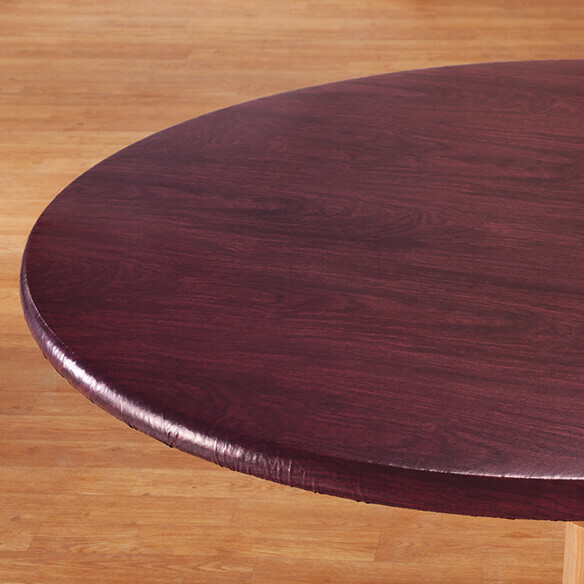 Oval fits tables up to 42" long x 68" wide. It fit very well. I should have gotten a darker one. It is for an antique dining room table & fits perfitly. It saves my solid oak table surface from things. Makes it easy to wipe up after spills and such. I have one on every table we eat at. This covers up my old and used cardboard table and makes it look like new again. Cheaper than buying a new table. I love the look of it under my lace tablecloth. Also it will prote4ct my oak table. I do wish they had one more size as it is a little big. The fitted table cloth is great. Fits good and stays in place. It looks really good and it saves wear and tear on my tabletop. I am very rough on tables !!! This fills the bill. Completely happy with it. Yes, it is wrinkled at first, but those wrinkles come out easily when it's stretched on the table. I love it. Love the wood grain look! Usually buy the tablecloths with a design, these are really nice and lookd great with a color placemat. I bought 3 of these table tops-2 round, and 1 large oval one and they are wonderful! One of my round tables was 36 inches, and wasn't sure if it would fit and it did! 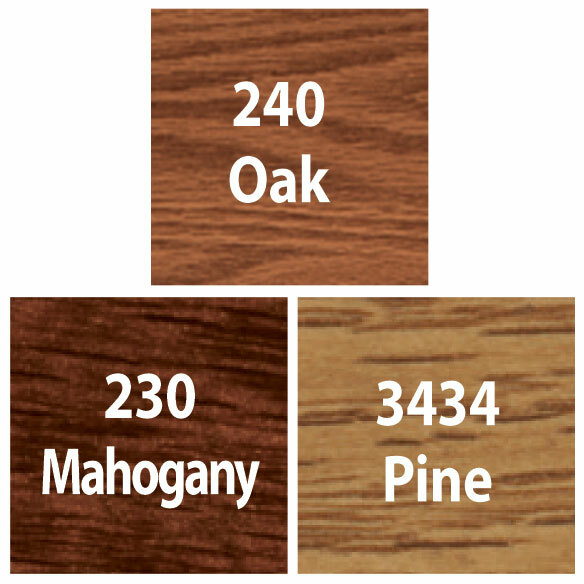 The quality is great and they have the 'look' of wood=I got 2 of the oak, and 1 of the darker one....have already recommended to quite a few of my bunco friends who were at my house when I had them on my tables and they wanted them! Very secure and easy to clean and fold up for storage too! Thank you!!!! I would buy it again it is very well needed. I have 3 grandchildren that leave their handprints all over the table. So after cleaning it I put the table cloth on it & it stays clean for awhile. I was overworking myself. Not anymore. Thank you. Protects my wood table top. This looks great on my table top. Besides protecting the real wood underneath it has fooled many thinking it was the table top! I love the green marble, it's lasted almost a year compared to everyone I've bought in the past years that one last a month or two. I bought the woodgrain one on account of doing a color scheme change. I haven't used it yet, as I need to paint first. My third purchase of buying through the years, love it! Get lots of compliments people think it is a wooden table, but it is a round glass table. Long lasting, easy to care for! My parents use this table cover constantly on their wood table. It matches the grain so you don't notice it on the table in their senior living apartment. It is exactly what I hoped for! This is a great tablecloth! This table cloth is perfect for a Mah Jongg game. The tiles do not stick to the cloth and move freely. It wipes off easily. The fit is just perfect on my 42" round glass table top. I am so happy that I found this cloth. love it... been ordered any color of table Covers. Love any color of table covers that match the kitchen color.... easy to clean and it brighten the kitchen.. I like how the elastic fits nice around my table. He came a little wrinkled. But starting to straighten out the longer I have on table. Great woodgrain colors. Elastic edge for tight fit. I will be buying more. I love this item.. its the best tablecloth I've ever own. I have this on my dining room table and it matches my table. It fits nice and snug and doesn't move.it's easy to clean. I have used these elasticized tablecloths for many years and in different colors and absolutely love them. I use this on my table that I have on my deck. Very happy with this tablecloth. Wish it was a little darker more like dark Pine but otherwise ok. Would certainly buy again. If your kitchen table is used a lot like my kitchen table is....this is the perfect table cover! It wipes clean and continues to look great as it goes through the wear and tear of daily use! I saw that my friend had a black round table cover and i didn't even know It was a cover. When she told me, i had to get one too. I have two toddle and this protects my table top from scratches and spills. I love It And would highly reccomend It! Looks great on my table!! I use this cover on a 36 inch round kitchen table. It fits this size very well, but I understand why reviewers with larger tables have had difficulty. It is pretty wrinkled at first, but that fades after being on the table for a few days. 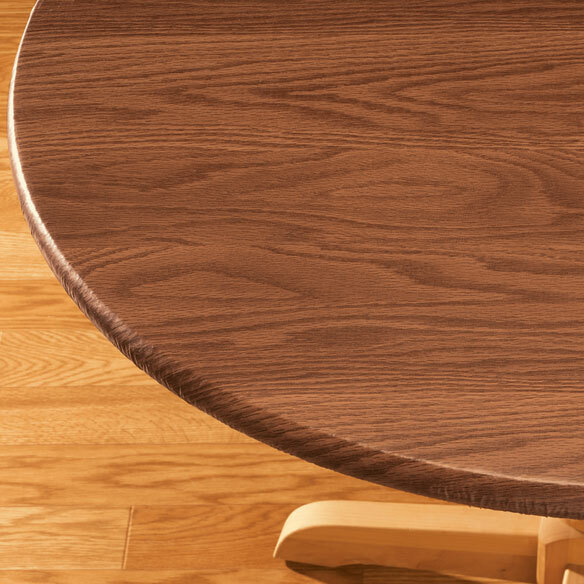 Standing a few feet away, this looks like a real wood table. This works better for us than purchasing a costly table pad for the occasional game nights we host..and looks so much more attractive. The Wood match Table Cover was a perfect match for the Oval Tables and it looks good when we decorated it. Love this table cloth. Softens up in the dryer for a few minutes and fit my 48" glass table perfectly. Product looks much better than it shows in the picture. Delivery was very quick. The vinyl tableclothes that fit the table are great for families. This looks like wood. I was surprised. I have used this type for many years and they really last. This product is great because it fits tight and doesn't slide off table top like a normal tablecloth. For that reason, it's great for when the grand kids come over. It also looks like the natural wood on our table top and protects it from damage. It is a great protector for my Oak table, and it looks like wood, too. Blends in beautifully on the table. You can't tell it's on. It will protect my investment for a long time. I like the fact that it is elastized. It doesn't wrinkle on the table. It fits perfectly! I found the this Round Table Cloth/Cover to be True-to-Size, very strong/durable, easy to clean, nice color & design for a fair price. I protect my wood table with the convenient look-alike pattern. They wipe clean and are very durable. Helps cover a stained table. This is great piece for the money, fits my table to a T. I have a very nice Maple table that gets beat up if it's not covered. I'm planning to buy another in a different design. Great value for the time this table cover saves me. I cover my glass table during the week and just wipe it down after removing the plates. We purchased this hoping that it would meet our expectations and it did. Bad thing is that we found it had torn a little hole in it a couple of weeks after putting it on the table. One of our friends thought it was the real wood grain! I was skeptical ordering this because of some of the bad reviews, but I am absolutely thrilled with it! It feels sturdy to me, I haven't been at all worried about tearing it, and yes, it was very wrinkled. I just laid a bedsheet (any thin cotton would do) over it and used an iron on low. Looks perfect. I'm also surprised at how real the woodgrain looks. I put this on a 36" lazy susan on my pine dining table, and it matches almost perfectly. I highly recommend. I use this tablecover for everyday use and love it. My sister came to visit and couldn't tell it was a tablecover. She was very impressed. It is easy to clean. Be a little cautious though. It tends to wrinkle if elbows or arms are pressing too hard against it. So I have a Woden dining table that has a lot of wear and scratches on the surface. I was so close to getting rid of it and buying a new one. I never knew there was elastic tablecovers with wood prints on it. I did a quick google search and came across this. I love it. It fits perfectly and looks great. I saved myself hundreds of dolars by buying this. Looks great. Guests even thought it was actually wood. Love the fitted feature since previous tablecloths slipped. Also was pleased with the cost. I really like these table covers! For a great price you get a nice table cover that looks so much like wood but protects your real wood! Even buying a new cover once or twice a year is well worth it! I use this table cloth on our patio table & it's so easy to keep clean. Will probably order another one in a brighter color. I purchased this covering for my dining table that seems to be the ideal place for everyone to place their baggage! I always tried to keep the area clean but somehow no one seems to hear me. This covering has been a lifesaver for me. I even purchased one to use when my table is extended. I have had many compliments on it. I leave it on the table all the time. I WOULD RECOMEED THESE FITTED TABLES COVERS TO ANYONE WHO LIKES FITTED ONES. I HAVE ORDERED SEVERAL AND VERY PLEASED WITH THEM. My kitchen table is old and has few scratches. This tablecloth matched perfectly to my old table.Looks great. Thanks you. I love the tablecloth, but I can't get the wrinkles out. I tried to iron with a warm iron. And almost ruined it. I purchased this table cover as I had accidentally spilled some acetone nail polish remover on my table, needless to say it took the finish off so my table looked horrible. This cover matches perfectly. this tablecloth is our second one,the last one lasted almost 8 yrs. I ordered one of these covers for my small glasstop table and liked it so much I ordered a second one for me large glasstop table. I found them to be very attractive and a very good buy for the money. I am planning on buying more as I really love it! Love this table cloth as it fits like a glove and stays on the table. It looks great and no over hang. Living in a comity live apartment, we have an common room for activities. This cover saves the finish on the table with hard use. Like the colors match any decor. I wanted this for under a tablecloth. Great quality!! This will do! It will keep my table from further damage!! Covers my glass patio table perfectly, keeps it clean and protects glass dishes from breaking!!! I like the idea, and it works, but not small enough. Looks sloppy cause it does not fit. I am really happy with this table cover. It looks great and provides protection at the same time. It really looks good and I would buy it again. As previously stated used on diningroom table as the cat likes laying there so the table is protected from scratches. It is so easy to clean. And it looks like my table. So attractive. I was amazed at how the Oak Printed Table Cover matched my round vintage wood table. My Family didn't even notice that the table was covered, until they sat around it and felt the smooth surface. They said wow! It looks exactly like the oak wood that is under it. The fit is good, and it really protects my wood table top from spills from my Grandchildren, etc. I also make crafts and sew on my sewing machine, and it protects the wood from scratches, etc. I have only had it for a short time, so I will see how long it holds up, but for now, I am quite happy with it. Fits and works great on my glass table,. It protects my glass top table while we play cards. Fits great and looks good too. It has made my old worn out table look new again. And most people don't notice it's a clothe until they get right on top of it! This is the perfect table cover for my kitchen table. The tone is compatible with the furniture and it fits perfectly. There were a few visible wrinkles, at first, when I took it out of the package, but they disappear over time. This is a great product to protect the actual table and the cover is very easy to clean. It's exactly what I needed! The elastic keeps the cloth in place, no shifting around. No overhang to get caught on. The cloth was pretty wrinkled when I first unfolded it and placed it on the table, but us smoothing out with time. Places where plates have been at dinner time have smoothed out. It has a flannel bottom to protect my table top, easily wipes clean with a damp cloth. Every time I walk into the dining room, my thoughts are I need to cover that wood table. I will use it until it wears out, and then I will buy another one. love it. Great fit. Looks like wood. Fits great. Looks great. Stays on for a nice fit. What a deal at this price. Love it! Fit perfectly and look very nice on my kitchen table. I was looking for a product that would not look cheap! Love it , Love it, Love it!!!!!!!!!!!!!! I have a daycare in my home. This really saves my table. I was amazed how well and long it lasted before needing to replace. We use the table every single day we do alot of crafts. And no one realized I had my table coverd, until one of my kids pointed it out. How cool is that. Please keep this product. I use as everyday table cover. It's convenient and easy to clean. I like the neat look! The table cloth was very wrinkled so I put it in the dryer on low heat for a short time & that helped wipe out most of the wrinkles. I really like how it fits on my table & the wood grain is a great look. My table top is 42" with a 1" thickness, this cover fit perfectly. It looks good and the material feels sturdy. Only have had them for a few weeks. So far they are working great. The elastic edges are great. Looks great and fits perfectly!!! I like the fact that it covers just the top of my table and allows me to enjoy the beauty of my wood table. I use this table cover on my kitchen table that is the same wood surface as the table cover. It protects the wood on my table and matches the finish of the wood. Looks attractive. Cleans easily. The only thing you have to be careful of is not to put too hot of dishes on the table cover. Otherwise, I love it. All great. Need some pretty designd. I have a 36" round table with a 4" drop. This table cover fits great. Easy to clean and very pretty. I have a very old Table that has scratches, this tablecloth covers and protects from future damage. I put the tablecloth in the dryer (low heat) for about 5 minutes and the wrinkles came right out. Exactly the same wood grain as my table, it looks GREAT!! I have been buying these table cloths for many years and I love them. You never have to worry about them hanging unevenly or looking messy. There are several attractive patterns to choose from. Repeat customer of the tablecover!! I have bought numerous covers in the past and these are the best!! MADE AN OLD TABLE LOOK NEW. I HADNT THE FUNDS FOR A NEW TABLE AND THIS WORKED OUT WELL. I HAVE HAD PEOPLE COMMENT ON IT LOOKING SO REAL. IT DOES LOOK REA.! Use on my glass dining room table and add the look of a wooden table when in use. This product gives the appearance of natural wood. I receive positive comments from guests. They are one of the best I have purchased to protect my oak game table from my cat. I have been buying these for years! I have been using these table covers for years. I love them for protecting my tabletop. They are good quality and even though with small kids eventually they do get tears in them I think they are well worth the money. Easy wipe clean and I save my wooden tabletop. They fit my 48inch round table perfectly. I love the wood grain in this one. Sometimes I think there is no cover on the table! The tablecloth is used for family game night on an oak table. It fits the table and holds its shape with the elastic while in use. Very easy to clean with a damp cloth. I have had three other plastic fitted table top covers, two of them are of wood design and I found this one that is clear plastic, just what I wanted, my Oak Table is beautiful and I want to keep it that way. Now everyone can see how nice it is and it is still being protected! I just hope the wrikles come out of the plastic! We were given a similar product several years ago, and it wore well and lasted a long time. We use this on our wooden dining room table for playing games. This one seems a lot thinner than our previous one, and we just hope it will still be durable and wear well. Otherwise, we are very pleased. This is a beautiful table cover...once it's ironed! This had more wrinkles than I do! If you don't want to spend some time ironing it (I used a towel under a steam iron) don't buy it. It needs to be pulled and ironed at the same time to look it's best. You need to use a steam iron and patience for sure. 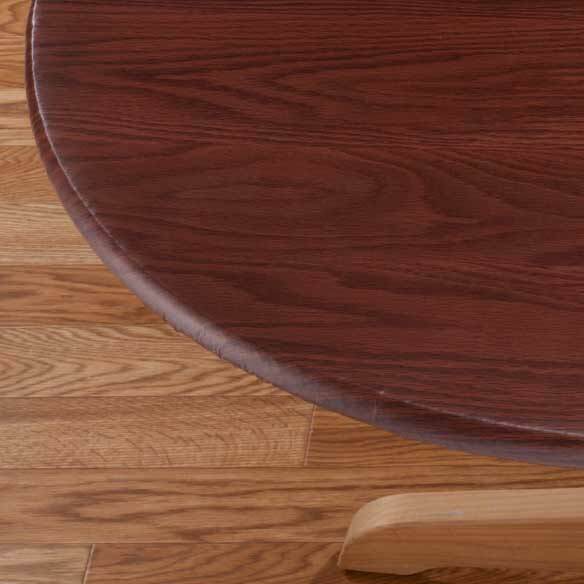 Easy to clean,stay in place, protect table's top and sides with the look of the original table wood. On my breakfast table. It is just perfect. Put carefully in dryer at very low heat for about 20 seconds to get wrinkles out. When you have a older table and want it to look like you've refinished it... this is a cute trick .. Perfect cover for my glass dining table. I bought this to cover a glass dining table when we play cards and other such games. Perfect! My table is 48" round and reviews for other covers said the 48" cover didn't fit a 48" table even though it was supposed to. So I bought the next larger size and it is great. It was very wrinkled so I put it in the dryer for about 10 minutes and it smoothed out. Haven't had it long enough to know if it will wear well. For our old round scarred table, it now looks like brand new. Perfect for warm plates without placemats. Also perfect for playing card games as well as rolling the dice for those games. Doesn't slide off with daily use and easy to clean. It is great and I cannot wait for the wrinkles to come out from being in the package. The wrinkles can be removed by putting it in the dryer with a damp towel for 10 minutes. We were given a similar product as a gift and enjoyed it for years. This cover, however, seems a little lighter in weight, and we are concerned about its durability and lasting power. Still, overall, we are very pleased. Used on our small kitchen table. The wood grain actually looks pretty nice. It is very thin and could tear easily. We bought another one, just in case. Just got this and it fits my new table perfectly! I bought it to protect the wood but I would never think of putting a hot/warm plate, bowl or pot on it without a hot pad. When the kids spill it will be great. Just ordered some more. I liked this table cloth so much, after I got it, I ordered two more afraid when it was time to replace I woulnd't be able to find it again. It really protects on my woodgrain table, fits perfectly, and until you actually sit down at the table can't tell it is vinyl. People are always amazed when they realize it is vinyl and want to know where I got it. The product is good and I ordered it twice. My only complaint is that it could have a thicker backing and that it does tear easily. I would order it again as it does make a nice appearance. I purchased the 40" round wood grain fitted tablecover and it fits perfectly. I chose the pine color as it was shown to be the lightest but it seems to be as dark as the oak in color. As stated - it fits perfectly ! It does have a lot of wrinkles and the backing seems to be thinner. I bought this and several other elasticized tablecloths to use on a glass table in my dining room. The wood looks so natural that people have thought the table top was wood to match my chairs. So much easier to clean than the glass and great for cards, dominoes and other things that happen at my table. You do have to be careful, though, because the vinyl tears easily. Absolutely indispensable to cover my aging oak table. It looks wonderful as a protector. I would only make one improvement. The elastic band at the edge would be so much more inconspicuous if it were brown instead of white. Great for family table especially if you have children. But the plastic is not durable at all, plastic is too thin, also it's so wrinkled! it is great I enjoy it on my talble very much except I would have liked it to be a little bit more snug.. wipes nicely,protects my table.. It takes a second glance to realize it is not the natural wood. My third order because they do tear and shrink with heat, but that is to be expected with regular use. It looks very nice and protects the wood table. It fits the table snugly. We use it for our family dinner table. You have to be careful about not letting anything hot touch the surface because it will melt. for what it is.. a plastic tablecloth.. this is pretty nice! The extra leaf in my antique table does not match exactly, so with this cover, when the table is set, it looks lovely! The bonus is that when my husband gets up from the table, he doesn't take the cloth with him!!! If you put it in the dryer with a wet towel on heat and then put it on the table, the wrinkles will come right out. The quality has improved with this table cover compared to previous ones. Hint: Tumble with a wet towel for 10-15 minutes to remove any wrinkles and place on table right away. I bought two of these in the Oak color. When they came, I thought they sent me the Mahogany, cuz it was so very dark. I have mostly light oak in my home. The oak pattern was real nice though. I kept them anyway, because the two sizes I ordered, one smaller round for my 38" kitchen table, and one larger round for my 48" dining room table fit good. They weren't wrinkled like other reviews stated, but having owned these kind of table cloths before, I would just throw it in the dryer for 5 to 10 minutes, and put it on the table right away. What I liked most about these from Miles Kimball, is that the backing doesn't stick to my table when I remove it after having it on for a long time like other more expensive ones I have ordered from other websites. I am ordering more now because I spilled a bottle of acetone fingernail polish remover on it, and it totally took the color off, and 'melted' the vinyl. The acetone also melted the back of my TV remote, so I know it wasn't due to the quality of the table cover. My previous experience with these types of table coverings is not to throw them in the wash. Not even on gentle cycle. I would hand wash them and dry them in the dryer on low heat for only about 15 to 20 minutes. Be sure to put them back on the table while they are still warm, and you won't get wrinkles. (unless the table cloth is too big for your table)I am a little hesitant about ordering any other pattern/colors, because I am not sure that the color I see on my PC is what I will actually get. But I will definitely order more of this color when mine wear out. I had a vinyl cover on already but it was thin. Put this one on top of the old one and really like the feeling of thickness this one has. Like it since it will protect the table and I can still put decorative mats on if I want to dress things up. Have made repeated purchases of this tablecloth for my aunt, who loves the style and fit. The wood grain looks surprisingly realistic, and the oak shade is perfect for her kitchen. The fit is also great for her wood kitchen table--fits nice and snug. Expect creases and wrinkles when you first remove it from the package--as other reviewers have mentioned, putting the tablecloth in the dryer for 10 minutes with damp towels (use very low heat setting) helps to smooth out the wrinkles. Cons are that the color fades pretty easily, even if used indoors only and cleaned only with a damp sponge. It also tears fairly easily, even with careful use (my aunt has no children and is not "rough" in her use). A thicker vinyl and/or a thicker flannel underside would go a long way in making this tablecloth more durable. That said, it's a great looking tablecloth--so many of these fitted tablecloths have goofy patterns and colors. The wood grain is a good fit for many if not most kitchens. I would buy it again. I just love these table cloughs. If you have kids or a Big kid (husband). These really save your good table. I have a daycare in my home, beleave me when I say this has saved my table. I hope they always sale this product. It Looks pretty good two. Most people don't even notice its a table clough. I just orderd 4 more - to have on hand. I use this product on the kitchen table Just wipe it off and that's it. It tears to easy. Looks great on patio and real wood look good enough to keep on all the time for wood protection and durability. It does just what I bought it for. Protection for my dinning table. The wrinkles won't go away is the only draw back. I refinshed my Oak round table Dad gave us for Christmas 20 years ago, that he made in his shop. I wanted to have the finish hold up longer and this is perfect! The Oak color looked dark so I got the pine color. Wrinkles came out after a couple weeks and it looks great. Also don't have to worry about it sliding this way & that. I also got one for my sister as she also has a oak table. It covers an older oak table so gives it a fresher look (except for wrinkles) Very easy to wipe off after a meal. of style and colors they get more money? I always order this product from here! Always order this tablecloth from here as they are reasonable and decently priced,,,,,have ordered from Walter Drake off and on for years,,,, good service and prompt delivery,,, you have my vote!!!!!!!!!!! I really like this tablecover. It looks good and have had many positive comments on it. I am hoping this one does not fall apart in the wash as my previous one did---even in the gentle cycle. I'm using this tablecover under a cloth tablecover. It doesn't fit an oval table very well, but would do good on an oblong table. I am using table cover to protect my new table. Although it is very wrinkled, even after a couple of weeks, it does what I wanted it to. I bought a second one! This is the second one of these I've bought. Was so happy with it the first time, decided to get a spare. I have used these for several years. Love the mosiac and woodgrain. Have given one to each of my daughters. They love them as well. Clean easily, protect from spills, kids. I only two suggestions: make the backing a little thicker to add more protection for the table, and create a Thanksgiving/fall colored one. Like the elastic fitting to this tablecloth for my small round Breakfast Room table. Nice appearance. Like the woodgrain look. Cover seems durable. I covered an expensive glass table when the grandkids visited and it held up well. The demensions seemed a bit off because it took some doing to stretch it completely across the table. Looks nice...would recommend. This tablecloth is exactly what it says, an oblong table cover. However, it does not fit my table very well as my table is sized towards the smaller range. We had to tape it to the table, and I will cut it down soon. The product is fine, just too large. My husband is very happy that the table cloth is no longer slipping around. This works great for daily use. It looks fine for a vinyl table covering. It is easy to slip off and on when I use a cloth table cloth. I didn't get the right size I guess. I should of got the next size it would be to big but it is better then to small. It's on the family table and wipes up easily. I ordered this item a little bit too big, my fault. I would order it again but the next step down. I'm using it as is now. But later will reorder. I was surprised at how light in color the Mahogany is. I Thought it would be darker. To me, it looks more like the Oak color. It is VERY wrinkled and we are trying to figure out a safe method to fix that. It is also not as hefty as I had hoped. I really have mixed feelings about this one. I'm going to recommend it because of the wood grain pattern. It was for my Dad so it has a manly look to it. Looks ok, but will it last! Used on a glass table. Had to return because of size and tear. Waiting on replacement! Don't need to put into dryer bcause of wrinkles- They fall out smooth w/in day after putting onto tables. Wish they would stay Dining Rm Elegance more than very few uses. Used on multi-tables in cafe' dining room. When used for table games,ie cards, dominos-too easily tear. Needs to be stronger/thicker? Have been able to glue tears from underside of tear if can clip all white stuffing--too expensive not to & still needs protective clear tape w/color marker over tape. Cheaply made and thin. Does not look like wood in person. I use these on a wooden kitchen table to cover scratches. I like fitted covers because they stay in place. Thus one does not fit as snuggly as I would like, but doesn't look too bad. A better grade of vinyl would be nice. This product has decreased in endurance. It appears as though the materials being used are of a lesser/thinner quality. THE WOOD GRAIN LOOKS REAL! i use this table cloth on our kitchen table. it protects the wood from our two year old granddaughter. I would probably buy one again, maybe it takes awhile to get rid of the wrinkles. Afraid to put in washer/dryer. Just fit out table top perfectly. But very wrinkled and has not smoothed out yet. The vinyl tablecloth is on my wood table to protect it from everyday scratches. It is working! I was disappointed that the tablecloth was so thin and it isn't tight however I do like it. Although you have a wide range of products to offer of good quality, your shipping charges to Canadians is out of sight. Those charges will prohibit me from buying from you in the future. I'll find what I want in Canada or from a retailer who ships to Canada for less. Shipping charges for 2 vinyl table covers was as much as the cost of the two items, that's rediculous. The cover was very wrinkled and had a chemical smell when I unwrapped it. I had to air it out on my porch for 24 hours before using. It's been weeks, and the wrinkles have diminished some, but are not gone to my satisfaction. I may put it in the dryer to soften it and "iron" it. Wrinkled , how do I get them out?? When I took it out of the package it is very wrinkled that is why I need to know if it can be washed and if so would the wrinkles come out?? it fit our table just fine but it was very wrinkled when we opened it and the wrinkles are still there and we have used it for a week. It doesn't look very nice. Tablecover fits well and looks okay. It was fairly wrinkled but a hair dryer seemed to take most of the wrinkles out. I actually ordered a second one for a back up if the first one rips as it is pretty thin. I didn't expect it to be great quality so I got what I expected. It works better for me than a tablecloth so I am happy with the results. I assume wrinkles will come out with use. ( It was tightly packaged to mail) Wanted to protect my beautiful new wood round game table from spills, etc. I am back to order one in the Oak color - the first one I got is really red! Looks more red than brown. Like others have noted in their comments - it tears easily - so I figure I will need to replace it every so often; which won't be a problem at these prices. To get the wrinkles out - I put it in the dryer on low for about 10 minutes and it came out great. I have bought this table cover from Miles Kimball many many times. Unfortunately, this time it arrived with a very small tear. I will be needing this item in the future and I am a little confused as to what to do. Fits my table perfectly. However, I can't get the wrinkles out of it which spoils the look. I love the idea of this invention. The reason I purchased it was because my 10 month old grandson has learned that if he pulled on the table cloth he could pull anything towards him that was on the table. I eventually see this as a bump on the head. Unfortunately they did not have the size I needed so I had to buy one that was way to big. It fits so loosely that he can still grab it. I beg you to make a variety of sizes to fit more . I would buy more in a NY minute. I bought this for my oval table. I gave it a 3 because the color and quality are nice But it is baggy and very very wrinkly! You would need it to sit a day or so to keep smoothing out the wrinkles.. Too bad. It fit table perfectly. But unable to get the wrinkles out even after being on table for weeks. Pattern not as was in past. No woodgrain pattern. 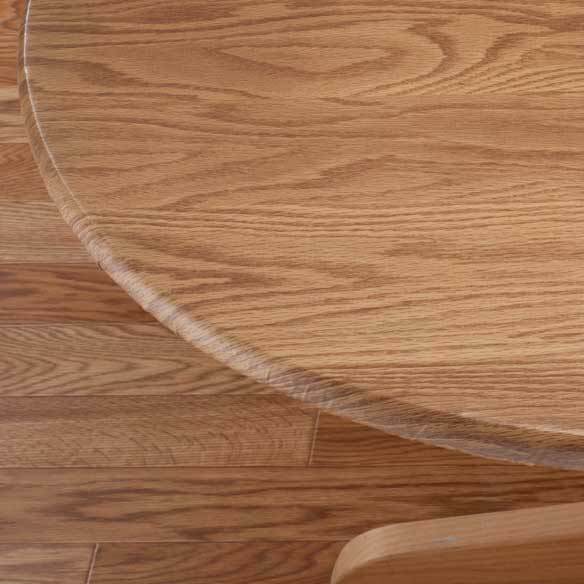 I use on round solid oak table - have ordered many times as pattern perefectly matched wood. Not so on this order. Seems Miles K. is raising prices and lowering quality. I just bought a solid oak tale set. I saw this fitted tablecloth and thought it was worth a try. I'm not sorry I ought it however, the quality is on the poor side. I don't think it will last very long. I wanted it for protection of my wood, but I would have to place something else under it for protection. It is more for cosmectic appearance than durability. This arrived with many wrinkles which don't seem to come out. It is supposed to have a smooth surface like wood. Not happy with the cheap look of the wood grain and I have not been able to get rid of the wrinkles so I have to cover the table with a table cloth when having company over. I haven't used it long enough to know if it will hold up to daily use. It's still a little wrinkled and has a smell to it. Hopefully that will go away quickly. We use the table this covers three meals a day and a lot in between. It does the job but is thin and gets holes in the plastic easily. I bought 2 to have a replacement on hand. Small dining table, but even though I ordered the smallest size, it was still too big. Fits perfectly, and the pattern is fight on, but it is incredibly wrinkled, and I can't remove them. But I like it, so I'll be keeping it. I PURCHASED THIS FOR MY SON & DAUGHTER-IN-LAW FOR USE ON THEIR FAMILY TABLE. THEY HAVE ART AND CRAFT PROJECTS FOR THEIR LITTLE ONES. THIS PROTECTS THE TABLE AND MAKES CLEANUP A SNAP! ONLY COMPLAINT IS THAT IT COMES TERRIBLY WRINKLED. A LOT THINNER THAN THE OTHER TABLE COVERS I HAVE ORDERED FROM MILES KIMBALL, GOOD IDEA TO HAVE ONE WOOD GRAIN LOOKING, BUT SHOULD HAVE BEEN MADE WITH HEAVIER MATERIAL. Nice table cover but when i went to put it on my table it was way to small. This is good for the price, but tears very easy and comes very wrinkled, and there is no way you can iron vinyl, so the wrinkles makes it look unattractive. I can't get the wrinkles out. I really liked the table cloth. The fit is fine, the color is great, easy to clean, I just hate the fact that I can't get the wrinkles out. Do you have any suggestions? The pattern is very good however, it does tear easily. So far, there are two very tiny pin pricks. We do however like the wood grain pattern. We are being extra careful in protecting the surface from any type of sharp object. It fit very well and with the exception of wrinkles which occured because of packing, we are satisified. We used a blow dryer to remove most of the wrinkles. My suggestion is to improve the packing method and to inquire as to a better strenght in the vynal itself. I had hoped to use this wood-grained fitted tablecloth as a casual day-to-day table cover - but the wrinkles are deeply embedded, and I wonder if it will ever smooth out. White spots are now on it. Color on the oak one loses some of it's color. Would not buy another one of these. White spots on some of it. Sure do hope that some of the other ones that I have don't do this. I would not but this product again. Everything else I ordered was great, except for the Tablecloth, not what it looks like in the Catalog, it was thin all Wrinkled & just cheap looking, totally different from its Picture. I use my kitchen table to eat, drink coffee, visit with friends. I have only been using the table cover for about 2 weeks and it is already started to tear. I first one I bought from you was a more heavier material and last about 1 1/2 years. protects my table, but I'm very disappointed that I cannot remove the wrinkles. The wood grain looks great but the overall quality is cheap. I love the wood grain but that's where the good comments stop. Construction is cheap. Extremely thin. It has torn with careful use. Only two of us, so it wouldn't last a day with a larger family. Doesn't look as good as the picture! I was disappointed in this table cover. it did not fit well at all--it didn't fit tight. As a result, there is no way the wrinkles would ever come out so it would never look natural. The backing on it was messed up as if it had been hot & came loose. Even though this tears easily and the wrinkles are not the most attractive it does protect the table top and it fits the table fairly well and does not slide around. .....I bought one for our game table top to protect it while I have the grandkids over and they do their crafts. It only lasted a few months and so I ordered another one to have available, when I opened it the folds in the table cloth were pressed so that it tore as I put it on the table. I would like to find this same idea in better quality. Great design idea but they use a flimsy, poor quality vinyl. I put it on my table for protection. I wanted this type of tablecloth and like the fitted type. It is a little darker than I was lead to believe. Looked good at first. Easily knicked and impossible to repair. Glue dissolved color. Ordered to replace same tablecloth mom has used, liked, and worn out. Selected cherry wood tone to match her dining room table and the actual color she describes as a "shockingly vivid blood red." Beware-the actual color is bright and bold, not as pictured. Was disappointed that color was not as displayed and was not as durable or attractive as a cover bought elsewhere for another table. The cover fits well but the finish pattern choices are poor. Finish wears off easily. Cover is too thin, should be a more durable material. wrinkles out and it looks ok but not great. I was excited to see this in the catalog. Have ordered several other table covers for my oval table. Was very disappointed when it arrived and the fit shows oblong/oval - therefore there is too much material to make the fit snug (like the other oval covers I"ve ordered)and it bunches up at the ends, so not pretty and makes table top full of wrinkles and unlevel. I use this product on my kitchen table. I've bought many of these tablecovers before and they lasted for a long time. This time I purchased 2 and I didn't even have it on my table for a week before it tore in 3 places. It used to be made of a strong material, but not anymore. It's made of a much thinner and very flimsy material now and it doesn't last at all. For the money it cost me I was very disappointed and I won't buy these again. It's OK for the purpose. The color was not Oak it should have been lighter in color. It also came with many wrinkles. Hope it thing smooth out through time. The size was to small, very smelly and cheaply made. I have no use for it. This plastic table cloth is attractive, but needs a much larger table than 48 inches. It was not tight enough to lay flat. Somewhat flimsy, too. the wrinkles from the packaging seem to be permanent. been on my table for 2 weeks and it looks no better. it does however fit vey snuggly, without bumps or creases. it does look like wood from a distance. Love the look-WAY TOO THIN! I use it on my all wood breakfast table to protect the wood from scratches and dings. It blends nicely with the grain of my wood table and chairs. Just wish it was a better quality vinyl. disappointed it did not fit our 42x68 table it was defiantly round not oblong. Had to return it! Arrived completely wrinkled and didn't flatten out--Ironed it with a cloth over it--Looks good now, and easy to clean however, snags easily. Has developed holes and cuts with little use. I will never buy from this company again ,product cheaply made and won't even refund shipping back! This product came defective with a tear in it. When I ordered it, it was on back order, it came about a month later than I needed it. When I finally got around to opening it, I noticed the tear right away, however when I called Walter Drake Customer Service, I was told it was too late to return, so I am stuck with a damaged tablecloth. Don't waste your money. This cover is on my kitchen table. The pattern is not very nice, but I thought the protection of my solid maple table was a good idea. It's been on the table a few days and the wrinkles have not smoothed out. It does fit tight, but shows no signs of smoothing. I may put it in the drier for a few minutes. If that doesn't work I'll throw it out. Tried to put this on a table and it would not fit. When I tried to "stretch" the corners, it tore like a piece of paper. Not good quality and it smelled terrible like cheap plastic. Item was badly wrinkled and did not straighten out at all once placed in the tabletop. Very thin and not at all what I needed. Definately overpriced for the quality. I have purchased this table cover in the past and was pleased with the overall quality. This table cover, however is poor quality and smells like gasoline. Not your usual quality. I have used this table cloth of 3 weeks and it has already torn. It was very easily damaged. It tears very easily. Would not buy again. Very thin. The product is very attractive; however It was on my table one day and a hole appeared. I do not know if it happened in shipping, but it was there right after I put it on my table. I did not send back because I did not want to pay [...] The second tablecloth is on an outdoor table and is wearing fine. Not great at all, looks wrinkled and seems to be very thin! Not Happy with this purchase at all! This would be a nice table covering, if you could get all the wrinkles out. I have ordered tablecloths for years from Miles Kimball and this is the first time I am disappointed! Supposed to be the same size I have always ordered (same table) and it is HUGE! Elastic is flimsy, vinyl very cheap, wrinkles galore and just all-around JUNK! Would have returned this but had already thrown out paperwork and shipping info. I like regular Miles Kimball Vinyl tableclothes with the flannel backing and have bought them multiple times. Thought I'd try something different this time and get the elasticized (fitted) one. While my oblong table is much smaller than 42" by 60" that this supposedly fit, there was no way it was going to reach the corners of the table. It was way too small; and it cost as much to ship back (and exchange) as it cost in the first place. I don't recommend this product for oblong tables. Not a true brown wood color and it was too small for my 44" table. Unable get the wrinkles out, definitely does not look like the picture.